IF THE TERM Evangelical Christian evokes images of the American south, you might be surprised to find that there are people practising the faith across Ireland. Across Ireland, there are numerous churches and congregations. Many of those who practice are ex-Catholics, though many immigrants make up a number of key positions in the church. In terms of faith, Evangelical Christians beliefs are divorced from Catholicism in one key way. They believe that God’s grace is bestowed upon all who believe in the word of Jesus. They believe that works beyond that – charity or societal works – are an off shoot of that grace, not demanded by it. As Ludie Creech of Operation Mobilisation puts it: “The works are the fruit of God’s grace, not the root of it. “This whole idea of Evangenical Christians is a bit shaky ice because peopel have different definitions. “We believe that people are saved through Grace, Faith and Jesus Christ alone. God has been good enough to grant us salvation if we repent and believe. “Jesus said that he is the way, the truth and he extends that invitation to everyone who repents and accepts his teachings. Ludie himself came to Ireland in 2008, leaving Atlanta, Georgia and a job in landscaping. He and his family are based in Roscommon and work to spread the word of their religion. How did he end up in Ireland? “It’s a long answer. 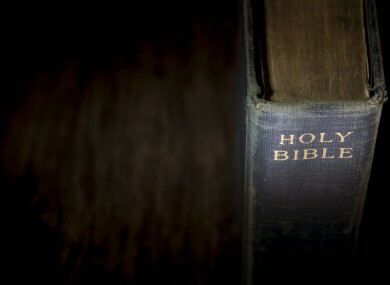 I became a Christian in 2002 and really began to study the bible and learned what it means to be a follower of Christ. I started to have this compulsion that the word of the Lord needed to be spread. Evangelical Christians are inter-denominational Christian grouping. Roughly 1.5% of Irish people are members of the faith. That makes Ireland the lowest percentage of Evangelical Christians in the English-speaking world. But it is important to note that it is a loose definition. The services are markedly different to Catholic masses. “We don’t call it Mass. We call it a worship service. There is prayer, singing of songs and preaching God’s word. Many Irish people will know Evangelical Christians are known for their enthusiasm, music and fervour. But is that all helpful? “That enthusiasm manifests itself in certain ways. Some of that isn’t helpful, some of the things you see don’t help. Irish people have a varying array of reactions when Ludie tells them of his faith. “There’s a wide spectrum of reactions. Some people are influenced by misconceptions like Christian TV and some of the zany things we see. “The past few years there’s been a lot of questions about organised religion, so it’s a good conversation starter. For more on Operation Mobilisation, click here or email info.ie@om.org. Read: What is it like to be a Muslim in Ireland? Read: What is it like to be a Mormon in Ireland? Email “What is it like to be an Evangelical Christian in Ireland?”. Feedback on “What is it like to be an Evangelical Christian in Ireland?”.